This week the first draft revising China’s Law for the Protection of Wildlife was released. While this is an important step, the issue of enforcement will be critical. China has a very poor record on enforcing laws to protect endangered wild animals-very few people have gone to gaol in China for poaching endangered species. Since the introduction of the Wildlife Protection Law, 25 years ago, many endangered species have come much closer to extinction and only 10 species had been added to the list. A major loophole in the old law is that it has only protected those endangered wild animals living in the wild. It does not protect endangered wild animals living in captivity (e.g. on breeding farms), many of which have been poached from the wild. The farms breeding endangered animals have long been disguising themselves as conservation centres, when they are in fact profiting from selling wild animals and their parts for food/medicine. The industry has been estimated to be worth 100 billion yuan annually. The law may also help curb the illegal smuggling trade, which China’s membership of CITES (Convention on International Trade in Endangered Species) has not satisfactorily been able to control. Hong Kong is the gateway to China and could do much more to address the problem of wildlife smuggling. A recent report by local think tank Civic Exchange found that between 40-70% of the global illegal trade in ivory is sourced for China and seizures in Hong Kong of illegal ivory bound for China establish that Hong Kong is a major smuggling route. The same report estimates Hong Kong as taking 50% of the legal and illegal global trade in shark fins and 70-80% of the legal and illegal regional live reef food fish trade (much of which is then re-exported to the mainland). China’s new draft law is intended to ensure that both wild animals living in the wild and kept in captivity will benefit from protections from hunting and set standards for their living and breeding conditions. It is an important first step towards recognition in China that the welfare standard, and not just the economic value of wild animals is important enough to deserve legislative protection. Written by Amanda Whitfort. 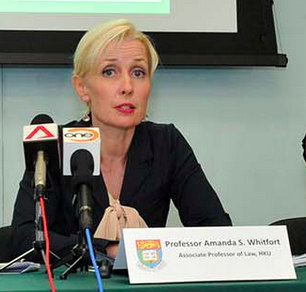 Whitfort presented her work on China's animal welfare laws at the II Global Animal Law Conference held in Barcelona in July 2014. Her analysis of the proposed China cruelty to animals law was published in the Sydney Law Review in 2012. Click here for news coverage on the new draft amendments.